Cards for men: Candy Time! I noticed my visitors passed 1,000 recently so I thought I'd run a candy giveaway. It's a Mo Manning image ( I just love her work) and if the winning entry correctly names the image I've used, I'll throw in a surprise. 2. Post about my candy on your blog or in your sidebar. 3. Become a follower if you're not already. Good luck everyone, I'll draw the winner on 27th November 2009 and post it here. Fab candy Donna.. I have added a link in my side bar and am already a follower. Can't wait to see what you are planning for the challenges. Its always so hard to make men's cards, so it will be great to get some inspiration. Great candy.... I will add a link to my side bar. I have notice you have changed it to Cards for Men before you had Cards for men and boys. Oh what a wonderful giveaway...I just love that bear. I have added you to my sidebar. Thanks for the chance. Donna the image you are using from Mo Manning is called "Eli and Butch going for a drive". Love that images also. Mo does not make any images I do not like. What a great giveaway Donna! I would love to win this CDRom. 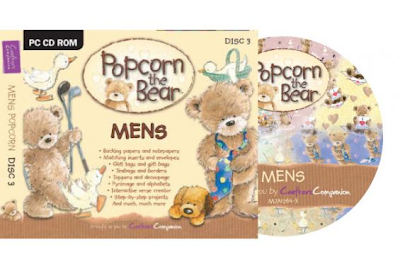 The Popcorn the Bear images are so cute! And I could always use some images for boys/men's cards! I added the picture and a link in my sidebar. And I also posted about your giveaway on my blog here. Thanks for the chance!!!! Wow Donna it looks as though its going to be a stunner, carnt wait to start on my card for your son, but you are going to have to tell me how old he is so I can pretty much gadge the sort of thing he might like. Take care with love and hugs Shirleyxxxxxxxxxxx And congratulations on achieving 1000 hits. Have only just found your lovely blog whilst doing a bit of "hopping" - what a great idea to have a dedicated "male" themed card blog! 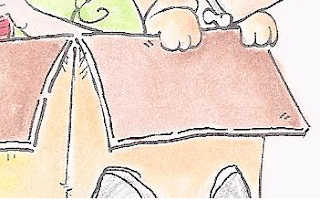 Would love to enter for your blog candy - the sketch is Mo's "Eli and Butch Going For a Drive" . I will add your candy to my side-bar, and gladly become one of your followers. Congrats. on your 1,000 hits too! Wow... great new challenge blog! Good luck!! Great idea Donna, look forward to your first challenge in anticipation and for some inspiration. I've added your Candy and blinkie to my side bar. Good luck with the new venture, I'm sure it will be a big success. Hi Donna, thanks for the chance to win your great candy, I've become a follower & put a link to your candy on my sidebar. I love Mo Manning's illustrations and the one you've used is Eli & Butch. Congratulations for passing 1,000 vistors. I am looking forward to these challenges, and from the interest it will be successful. I have added your candy to my sidebar, and am follower already. Hi you,have a nice day ^^! . Your blog is very nice . Shirley, how is it that I missed this challenge? I make tons of guy cards as most of my hubby's family are guys. I'll be watching for that first challenge! Love your new Blinkie! I linked your candy in my sidebar and thanks for the chance to win! Congratulations for passing 1000 visitors! It's really fantastic you're started a blog for only Mens Cards. It's nice to see something is only making mens cards, because it seems difficult to making them and we can get some ideas then on this blog. You're giving a great candy away, so I've put you're candy into the sidebar of my blog and became one of you're followers! Count me in for the candy, I'll be happy to put this on my sidebar Here and I now follow! I am a new follower. Your blog is great. I posted it on my sidebar.Good luck with your challenges. Hi Donna Congratulations on reaching 1000 hits. I have become a follower and posted about your blog candy on my blog, and the image you are using is ' Eli and butch going for a drive'. Think I have covered it all, Good luck with your new challenges, cant wait. Congrats on your first thousand hits!! I love this Popcorn the Bear stamp set - thanks so much for sharing and giving us the chance to win it! Happy Birthday to your son - can't wait to see the card in its full glory! Congratulations on 1000 visits and I look forvard to the challenges. The Mo image is "Eli and Butch". Thank you for the chance to win, I love the adorable Popcorn bear. Great candy, I just found your site after visiting nannieflash's blog. Have linked it on my sidebar. Wow wat a great candy! Love Popcorn the bear! Thank you for the chance, have you linked you in my sidebar!